English Malayalam Typing Converter helps to write Malayalam. Type the Malayalam text in English letters on the area below and press space key. It will convert to Malayalam. Don't copy and paste words. English Malayalam typing converter is a tool to write Malayalam using English letters. It helps to write Malayalam words using English keyboard in mobile or web browser. The characters are converted to corresponding Malayalam letters by its vocals. To get a Malayalam word just type the word using English characters (Manglish) and press space. It will automatically convert to Malayalam word in these tools. Also, a suggestion list will appear to select the correct word if the default word given is not the target Malayalam word. To see Malayalam word a Malayalam font is installed on the system. If it is not installed then square boxes appear insted of Malayalam content. Then download and install a Malayalam font into the system for correct reading. Malayalam fonts are free to download and use. Malayalam is the formal langauge in Kerala State. Malayalam is one of the 22 official languages of India. It is a majour regional language in India. It is spoken by 36 million people primarily in the state of Kerala and in the Lakshwadweep Islands in southern India. Malayalam is one of the spoken languages in Singapore, Malaysia, Thailand, Dubai, Bahrain, UAE, Kuwait, Saudi Arabia, Qatar, Israel and United Kingdom. Malayalam has official language status in Kerala, India. 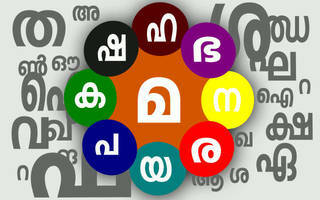 In Kerala regions, Malayalam is used in government, commerce, and in visual and print media. Throughout the period of the British rule of India, English was the language of most education above the elementary level. It was required in all administration above the district level, and was the dominant language of the print media. After Independence in 1947, the state government of Kerala started using Malayalam in administration and communication. Malayalam langauge got an official dicitonary, grammer rules, lexican by Kerala government. Malayalam univeristy is dedicated to the research and development of the language. Malayalam has borrowed many words from other languages such as Sanskrit, Hindi, Urdu, Arabic, Persian, Portuguese, Dutch, French, and English. The majority of lexical borrowings came from Sanskrit, Tamil, and Urdu. Malayalam uses compounding and reduplication to form new words. As a result, compound nouns are very common in the language. In addition, there are numerous onomatopoeic words many of which are reduplicated. Malayalam Fonts are freely avaiable on the internet and they are very easy to download and install into the system. Malayalam unicode fonts are released by various language development communitites like SMC. These fonts are avaiable on free license so there is no need to pay for the font.